- Two pies, one basket: put one on the bottom and another on the tray. - Handcrafted with an ash wood body, solid birch lid, and brass hardware for lifelong durability. - Made in America with American materials. 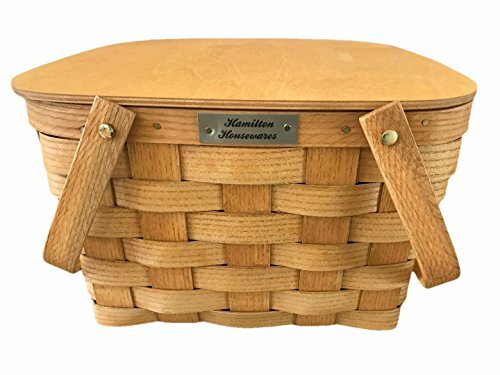 Move your pies, cakes, and more with the Hamilton Housewares Two-Pie Basket. Take two pies at once or put one pie on the tray with the dishes and utensils on the bottom. The choice is yours. Either way, you're getting a handcrafted, American-made beauty built to last a lifetime. - Makes a great picnic basket, with or without the tray. - Bring two dishes to your neighborhood potluck. - Take an entree and a dessert at the same time. - Put it on your bike's handlebars for storage. - Makes a fabulous wedding present or holiday gift. Click Add to Cart at the Top Right to Order Your Basket Now! ➤ Holds two pies easily - one on the bottom, and one on the included removable tray. ➤ Two swing handles for convenient carrying. ➤ Solid birch lid with dual brass hinges for safe transport. ➤ Durable, attractive handwoven ash wood weave construction. ➤ Made in USA with 100 percent American materials. If you have any questions about this product by Hamilton Housewares, contact us by completing and submitting the form below. If you are looking for a specif part number, please include it with your message.